Myth: Cracking your knuckles throughout your lifetime will eventually cause you to have arthritis. Have you ever cracked your knuckles and had someone yell at you to stop because it causes arthritis? 25-54% of the world’s population cracks their knuckles, men more so than women. Does this mean up to 54% of us will get arthritis? The short answer is no. There are different types of arthritis and no study has ever shown a link between cracking your knuckles and it causing any type of arthritis. Let’s talk about why and what is actually causing the “cracking” noise when you crack you’re knuckles. The knuckles are the joints formed by the bones in our fingers. Each finger consists of three bones (phalanges). They’re named based on where they are in relation to the palm of your hand. There’s the proximal phalange (closest to the palm), the middle phalange, and the distal phalange (farthest from the palm). The first knuckle is called the metacarpophalangeal joint (MCP). (Say that after drinking 3 beers and watch the laughter ensue!) The second knuckle is the proximal inter-phalangeal joint (PIP) and the last knuckle is the distal inter-phalangeal joint (DIP). The fingers, and thus the joints, are held in place by ligaments and tendons. There are no muscles in the fingers and movement is controlled by forearm muscles pulling on your finger tendons. Your knuckles are also covered by a joint capsule known as your synovial capsule. There’s fluid within this capsule known as synovial fluid. This fluid provides the lubrication and nutrients needed for the joint and surrounding bone. This fluid also contains several gases (oxygen, nitrogen and carbon dioxide). When you crack your knuckles, you stretch out the synovial capsule creating a negative pressure within the joint. This pulls the gasses out of the fluid in the form of a bubble which bursts to create the popping sound. To crack the same knuckle again, you have to wait for more gases to build up in the synovial fluid. There are over 100 different types of arthritis. Generically, arthritis is simply inflammation of your joints. It can be caused by everything from autoimmune problems (rheumatoid arthritis), bacterial infections (nongonococcal bacterial arthritis), to sexually transmitted diseases (gonococcal arthritis). 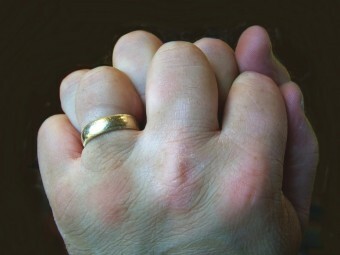 In the case of cracking knuckles, the type of arthritis often thought to be caused by it is the most common, osteoarthritis. Osteoarthritis can be a normal result of the aging process. It can also be caused by excessive wear and tear on the joint. The result is cartilage breaking down and wearing away. The bones can begin to rub together and sometimes cause spurs to develop. Pain, swelling, and stiffness are the most common symptoms. So does the constant “popping” of the gases within the synovial fluid cause the “excessive wear and tear” that can cause osteoarthritis? There have been several studies that looked at this question, and none have shown that habitual knuckle cracking causes wear and tear. One study looked at 300 patients over 45 years old and found that among the worst knuckle crackers there was no increase in the incidence of arthritis. They did find, however, that the more you cracked, the lower your grip strength was over time. So the next time you feel like cracking your knuckles, do so with the knowledge you won’t get arthritis from it. You might, however, have damage to your ligaments and tendons that reduces your grip strength, but hey, what vice doesn’t come with a little risk! One doctor, Donald Unger of California, chose to go the extra mile when it comes to finding out whether cracking knuckles causes arthritis. He cracked the knuckles, on his left hand, twice a day for 60 years. He didn’t crack the knuckles on his right hand. After 60 years he noted, “There is not the slightest sign of arthritis in either hand”. Don’t think his self sacrifice went unnoticed. He won an IG Nobel Prize for the feat in 2009. According to the CDC, approximately 22% of people 18 years or older have arthritis. 50% of people 65 or older have it. If you’re overweight, you have a 10% greater chance of being afflicted with it. Yet another reason to lose weight. 16,000 kids in the US have Rheumatoid arthritis. It accounts for approximately 992,000 hospitalizations a year and 3.6 million hospitalizations list arthritis as a secondary diagnosis. This accounts for about 14% of all disease-related admissions and costs approximately $128 billion annually! Another common cause of arthritis is Lupus. (See: What is Lupus) Known as systemic lupus erythematosus (SLE), it can affect several different body systems at the same time. Central and peripheral nervous systems, digestive tract, heart, lungs, skin, and yes, joints. The presentation really revolves around which systems are affected and how severely they’re influenced. The symptoms can range from mild to serious and can even lead to death. It affects approximately 1.5 million Americans, and about 16,000 new cases are diagnosed each year. Unfortunately ladies, 90% of the cases are women between the ages of 15 and 45. Treatment for arthritis involves reducing the inflammation and pain control. The most common over the counter medications are nonsteroidal anti-infammatories (NSAIDS) like ibuprofen, aspirin, and naproxin. Should you have more chronic issues your doctor might prescribe steroids like prednisone. More recently there is a class of drug known as “disease-modifying antirheumatic drugs”, that help reduce the inflammation caused by your immune system. They take a few weeks before you will start to show signs of it working, so it’s recommended that you take these in conjunction with other anti-inflammatory drugs. Not a Nobel Prize. He won a Ig-Nobel Prize. @Serdar Erken: Yep, thanks for catching that!